Sewing rooms-For lovers of sewing and patchwork, it is essential to have a small corner in the house where you can work and have your tools, fabrics and threads. So today I want to give you a simple ideas to create your sewing rooms in a simple way. In this type of sewing rooms there are two elements that are essential, a good table with its corresponding chair. And a set of drawers and shelves to place all the tools and sewing tools. It is advisable to have a large number of drawers or small boxes to distribute the ribbons, buttons, scissors. We must also have several shelves to place the fabrics, in this case it is preferable that they are seen and not stored in a closet. Because the great color that the fabrics bring to the room will give joy to the room and serve as decoration. To save small items such as buttons we can choose to store them in small glass jars according to their color. This way they will also become a decorative element. And as for the threads. We can save them in the same way or create a small panel where to place them by colors. The table is essential in sewing rooms, and it is preferable that it has a large size. And is well clear of things that may interfere when deploying or cutting a large fabric. If we do not fit a large table we can choose a folding table that we can open when we need more surfaces. And the rest of the time takes up less space. Another fundamental element in this type of sewing rooms is the lighting, in addition to having general points of light in the ceiling. Or lamps will be essential to place on the work table a flexo or spotlight that illuminates this area in particular. There are decorative trends that can come great in this of the sewing rooms. The pegboards, for example, are very useful. Not only do they serve in the garages, for the DIY area. They also serve to order our objects and sewing elements. These boards allow incorporating shelves, shelves and baskets, in which you can store the fabrics. And save from your threads to buttons or ribbons. The best of all? That is economical and super aesthetic. Following with more ideas for sewing rooms, we must say that the aesthetics of this space will depend a lot on the taste of each one. However, a good idea would be to bet on white furniture, both on shelves and on the table. To let the color spread through the materials. Such as the case of threads, fabrics and other elements. 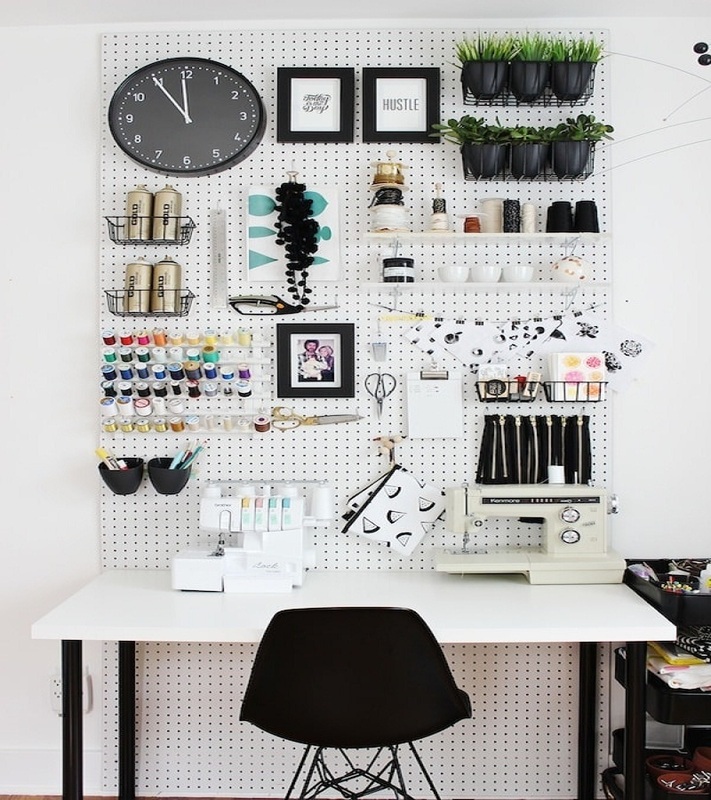 If so much white overwhelms you, there are very colorful sewing rooms that are also very nice. Shelves in some bright color, for example. And pictures and letters all over the wall. All watered by the color of your buttons, threads and fabrics. The order in sewing rooms is essential. There are so many materials, elements and tools that we find in these workspaces, that if we do not know how to organize them, they can mean total chaos. So, having shelves to have the fabrics and remnants well ordered. Or a panel to hang all your utensils, as well as drawers for larger pieces of fabric, is paramount. If you have always wanted to have a corner of sewing, but you do not have enough space, do not worry, This is not a problem. A small corner in your living room or office can be more than enough. In addition, there are as fun and original options as hiding the sewing area inside a closet, for example. The essential thing is to have a table to support you. Drawers to store your items and good light to work without straining your eyes. If you have a separate room to allocate for that purpose, you’re in luck. Now, ideally, you have a good source of natural light. Without a large window, much better. The brightest areas are the ones that will most favor us to work. You can put the sewing table or the sewing machine next to the window. And leave the rest of the room ready to place shelves and cabinets in which to store everything else. If it is a small room, it is best to opt for furniture and white walls. So that it looks much bigger thanks to the light. If you want more ideas to decorate or condition sewing space. What did you think of the proposals? Do you already have a space to sew and make your crafts? We hope that the ideas for sewing rooms that we have shared in this article will inspire you. It is not the first time that we speak of a corner as special as the sewing room. The truth is that there are many who ask us for more ideas about this space. So, although we love the decoration of this corner, on this occasion it is necessary to talk about order; and is that a sewing room without order can be a real chaos. Fabrics, as a rule, occupy little and much. Little because they are thin and easy to store. However, if we cannot find the correct way to store the fabrics in a sewing room, they will occupy a lot, filling each corner in the most chaotic way possible. Fortunately, there are many solutions, which can also be original and different, to provide that decorative bonus that we always like to find. For example, we can get an old wooden drawer, one of those used to transport fruit, for example, and fill it with tubes in the form of tubes. It is a useful way to have a large repertoire of perfectly ordered fabrics. As we love to recycle, we have loved an idea in which fabrics are stored recycling food containers. Now, any plastic tipper can be ideal for storing certain scraps and folded fabrics. We can organize them according to patterns, color, etc. If we like to have the fabrics in view, nothing like opting for a magazine rack. Although it seems a bizarre idea, the truth is that in our wall will be really good, being able to have all the fabrics ordered and also creating a beautiful tapestry of colors to adorn our wall. If we have enough space we can choose this way of ordering the fabrics that we have fallen in love with. It is about placing them as if they were part of a large curtain. No doubt an ideal way to go past them one by one and choose the one that we like the most in each moment. In addition, there are other more professional ways to hang them, such as these folding display units that will allow better access to them. Finally, do not forget that imagination is always your most faithful ally. If not, observe what a delight this form of storing fabrics based on baskets. The composition resembles a beautiful nest full of beautiful colors and remnants.